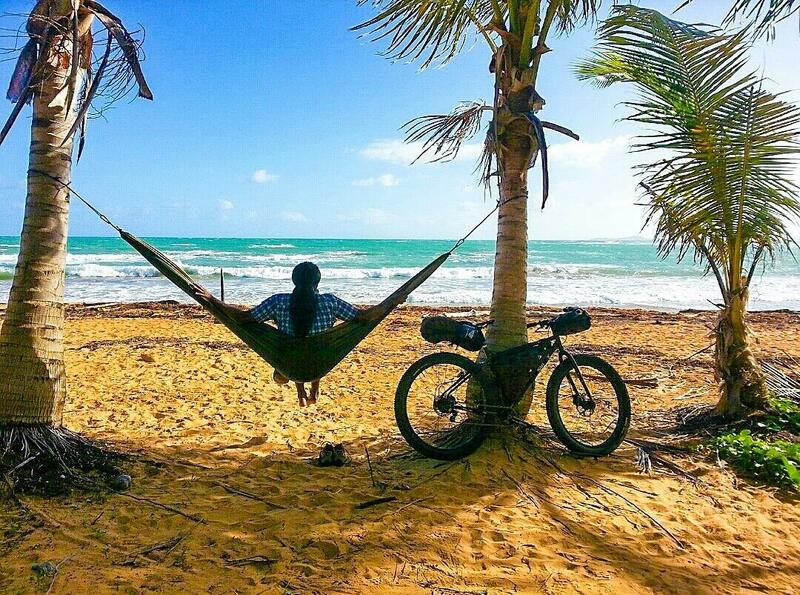 When did you start bike touring? I started bike touring about five years ago. I was living in Miami at the time. I was just doing over nighters and maybe two-three day trips here and there. I started going from Miami to West Palm Beach which was about 75 miles. I’d spend a night there then ride back. Or I’d go Miami to Key West. Through the year of doing that, I decided that the following year I would travel from Vancouver, Canada to Tijuana, Mexico along the Pacific Coast Highway. From there on I’ve been doing a new route pretty much every year. What inspired you to try those over nighters? I used to compete in triathlons and run some marathons. I just became bored with the concept of doing 30 miles or 50 miles. You’d train for that then after the competition, it just ended. I wanted more. I also get bored riding the same routes. I wanted to do multiple rides in places I had never seen before. My eyes and my mind would get bored from riding the same places over and over. That’s really what inspired me to start traveling by bike. It was a way to see more on my bike and do more riding. I love riding my bike. I can’t get enough. Tell me more about that first long tour from Vancouver to Tijuana. It seems like that solidified your love of bike touring. Interesting you say that. Before I went, someone said, “you’re either going to love it or you’re going to hate it.” And I loved it. I more than loved it. There are no words for describing my passion for bicycle touring. I didn’t know what I was doing, but that was the reason I wanted to do it. I didn’t know what to expect. I actually didn’t tell anybody, not even my father or my best friend, until two days before leaving. They were like “oh you’re crazy, what about this happening, what about that happening, what if you break your chain, what if you fall?” I’d never thought about all those things people were saying could happen. I just thought about going from one place to another place on my bike ride and that’s it. The tour was a fantastic experience. For the most part I was using Adventure Cycling Association maps, but sometimes I went off on my own. Locals would tell me, “oh don’t go that way, you’ll see more if you go this way.” What I remember most are the people I met along the way. I still have communication with many of them. It’s one of the reasons I love it. You hear the news, you hear all these negative things, people are going to mean to you and stuff. But it actually was the opposite of that. People were really kind throughout my trip. I would not have been able to do it [without those people]. I don’t know if there’s another bicycle traveler who could really do it all by themselves. We always depend on other people to help us along the way. You learn so many lessons from it. You realize that someone helped you and you must help someone else to pay it forward. For me bike touring became kind of like a spiritual thing in knowing myself. You have to stay in the present moment as you tour. If you start thinking about the challenges that you had yesterday and the challenges you have today and the challenges of 1,200 more miles to Tijuana, you’ll just go crazy and pack up your bike and go home. If you stay in the present moment of the mile you’re on and the mile you’re going to next you won’t get overwhelmed. Erick Cedeño in Puerto Rico. Photo courtesy Erick Cedeño. How long did that tour take? That trip took me about 38 days. I took a few days off. Not at the beginning. It was my first time and I didn’t know what I know now. Now I take pretty much take the seventh day off. After six riding days I’ll take a full day off. Physically I’m OK, but mentally I’m tired from traffic and directions and this and that. On my first trip I went straight from Canada to San Francisco in something like 15 days without a day off. I was feeling good, but I think it was the adrenalin kicking in. I was just riding, riding, riding. I didn’t care to spend a day off in the mountains of Washington or Oregon. I just wanted to get to San Francisco. When I left Canada I was thinking, I can’t wait to cross the Golden Gate Bridge. I found that it helped me to have a goal to reach. Then I finally spent three or four days off the bike in San Francisco exploring the city and stuff like that. Why do you continue to explore the world by bike. What is it about bike touring you love so much? The following year I decided to do the Atlantic Coast and went from Florida to New York City. For the challenge and also I like history too. I found out when you travel with a purpose you enjoy it more and learn more. I decided to focus that trip on the Civil War and visiting early American history through Georgia, South Carolina, North Carolina, Virginia. That became really interesting. The following year after that I decided to go from New Orleans, Louisiana to Niagara Falls, Canada, retracing the history of the Underground Railroad, which was the route slaves took from the southern states up to Canada to become free. I went to historical sites and I loved it. It was one of the most fulfilling trips. It was well planned out and I went to historical sites. There were also some sites that were not even on my route, but people I met along the way would tell me to go to this place or that place because there was history there. It became really interesting finding places that were not on the route. Going back to your question, my passion comes from meeting new people; really challenging myself mentally, physically, and spiritually to see if I can do these kinds of things; and exploring more. I have always liked to explore. Even when I was five, six years old, I had a great mother who would encourage me to go out. She never limited me from doing the things I enjoyed like hiking. I would go with a friend or by myself. We would prepare sandwiches to bring along. That sort of thing helped prepare me for my trips [in later life]. I have been a vegan for 20 years. That’s also an extra challenge to travel through the country and world by bicycle. But I’ve got it pretty much down now. And I always learn new things out on the road. All those things inspire me to plan a new route every year. It’s clear you’ve had really positive experiences with people and exploring and learning history on these trips. Have you ever had bad experiences while touring? The only bad experience I’ve had was about a year or so ago when I did the Underground Railroad. It took me 32 days. On my 31st day, when I reached Buffalo, New York, I was about 15-18 miles from Niagara Falls. I pulled over the night before and spent the night in someone’s backyard. The next morning, I went to Walgreens to purchase some extra things. It takes me less than an hour to ride 15-18 miles so I was taking my time. When I came back outside my bike was gone and all my possessions had been stolen. My journal, my GoPro camera, everything I’d gotten along the way when people gave me gifts. Everything was stripped from me. The only thing I had was my wallet and my phone. I was in so much pain. I had put so much work on this trip. More than I had on other trips because I was documenting it for family and friends with pictures, my journal. Because I was on this historical route, the Freedom Trail, I decided to continue the trip after all the anger and sadness had come out of my body. The people that traveled that route never stopped. They continued their journey regardless of obstacles along the way, and those obstacles were much bigger than a bike being stolen. I owed the people that traveled and myself to not end it in Buffalo. Luckily the people who had hosted me the night before had a nonprofit organization that takes kids and teenagers out on bicycles. They allowed me to borrow one of their bicycles. This is an early 1990s bike for maybe a 13 or 14 year old kid. I got on it and two miles in, I thought this was not safe. It was just too small for me. But I decided I’d already put two miles in. Going back would make it four miles, so I’ll just continue. I decided to take my time and reached Canada. I’m glad you were able to finish the ride. What kind of bike did you eventually replace the stolen touring bike with? The stolen bike was a custom touring bike from Seven. Really nice, titanium, built in Boston. It was beautiful, but we never recovered it. Since then, I purchased a Surly ECR. It’s more of an off road, bikepacking bike, but it allows you to get on road as well. I wanted to have a bike that allowed me to do that. It’s a 29er with 3-inch tires. Some people think it’s a fat bike, but it’s not. It’s just a big tire that allows you to go off road. You can also change it from a 3-inch to a 2-inch tire and I’ve done that depending on that route. Two months ago, I went to Puerto Rico and rode around the island on my ECR. It took me about seven days. I’m so glad that I had the ECR because Puerto Rico did not have the infrastructure to travel by bike. Sometimes I had to get in the dirt to get out of traffic and things like that. With this bike, I also did the Allegheny Passage in Novemebr, which went from Pittsburgh Pennsylvania to Washington D.C. It’s an off road bicycle trail that was old abandoned railroad. I was really the only one on the trail because it was so cold. The path was kind of smooshy. It took me longer than expected cause I was only able to ride 6-7 mph. If I had another bike I probably would not have been able to do it. I have frame bags and saddle bags. I haven’t taken more than a 15 day tour with this bike, so I haven’t used my panniers, but I also have a rack if I need more things to carry. The concept of being a bicycle nomad seems to have grown into your business Bicycle Nomad. Tell me about the business and your goals. Is that your full time job now? Bicycle Nomad is 100 percent full time for now. The business came about after my trip on the Underground Railroad. I was asked to speak at several universities and high schools and elementary schools about my journey and also the historical aspect of the trip. From that I decided to create some tee shirts so I could supplement an income while I go to universities and expositions and stuff like that. But the brand is bigger than tee shirts, it’s a lifestyle. It’s more for allowing people to dream and to see what else is possible. I always tell people that anyone’s a bicycle nomad. It’s why the website is I Am Bicycle Nomad. Anybody who gets lost on their bike in their own town or crossing state lines is a bicycle nomad. It’s about inspiring people to ride their bikes. From there this other stuff came up. Again being a vegan for 20 years, I carry my own supplements that I make. I’ve been doing that for five years on the road and I’ve been developing a supplement product that is all-natural based, no synthetics. You said right before you went on that first tour your dad said, “oh this is crazy.” What do your parents think about all your bike touring now that you’ve been doing it for five years? They always worry because they’re parents. But I make sure to keep in touch with my dad throughout my trip. I send him a text usually. I don’t usually call because when I’m on the road I barely have the energy to talk. I just want to be at peace. He also follows me along the way with google maps and things like that. Now that I have gone into doing lectures around the country–I just came back from doing a lecture in Virgina. 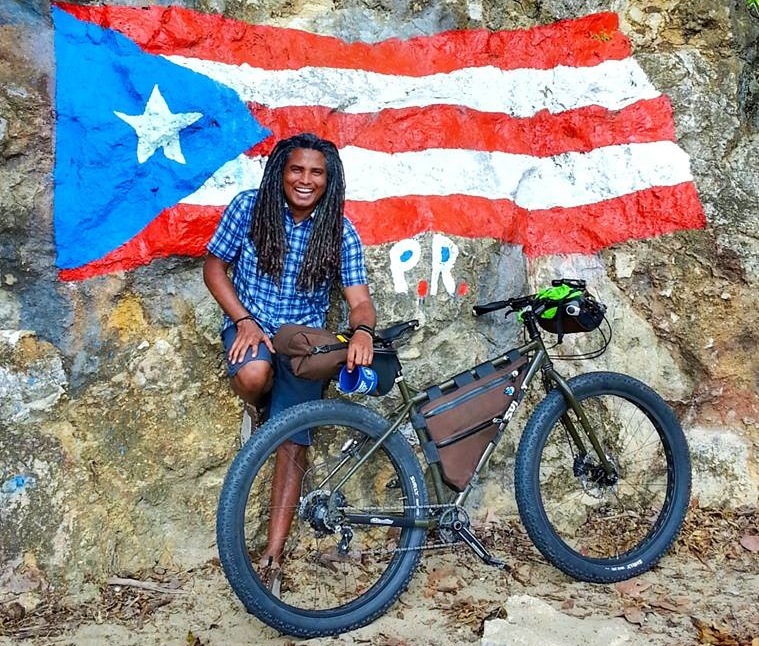 I speak spanish and next week I’m doing an interview on CNN Spanish about my bike touring. In May, I’m doing a lecture at the New York bike expo about my Underground Railroad trip. Now that it’s becoming more of a business and a passion and a lifestyle to be out there, they’re happy I’m able to do what I want to do. It was a dream I had five years ago and it’s evolving every year. Have you started planning your next adventure yet? I have a couple things in my head, but nothing concrete yet. I’d like to travel in Alaska. I would like to eventually go from the U.S. to Panama through Mexico and Central America on my bike. It’s a three or four month trip that takes a lot of planning. Even though I’m a bicycle nomad, I decided to apply to a doctorate program for naturopathic medicine, so my next journey might not be on the bike. 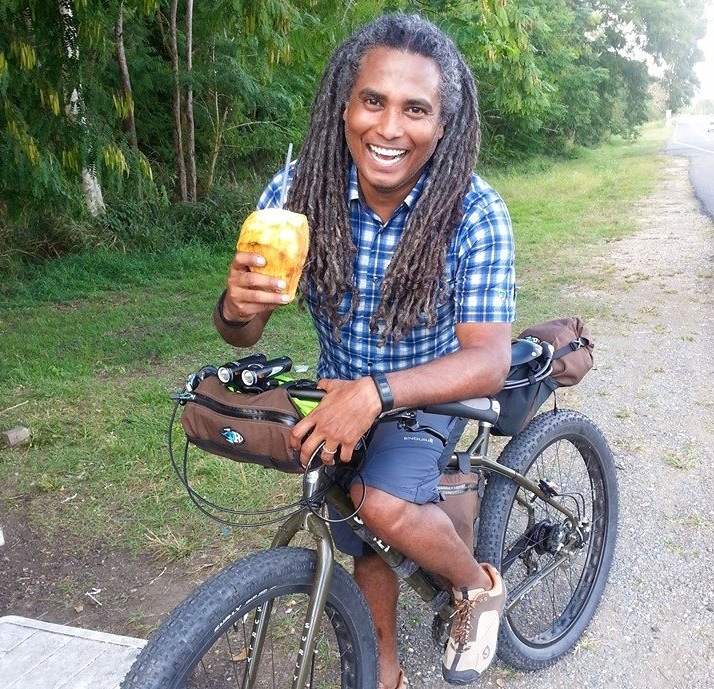 This entry was posted in Bike Touring, Interviews and tagged adventure cycling, bicycle nomad, bike touring, bike touring business, bike travel, bikepacking, erick cedeno, pacific coast bike tour, surly ECR, underground railroad, vegan cyclist. Bookmark the permalink.